The Bistro Bar is a great jockey box competitor to use at any occasion or event. Bistro Bar offers convenience when you need it while providing style with its good looks. Set-up is a breeze and storage is even easier. Mobility - Unlike jockey boxes, Bistro Bar may transport kegs of all sizes. Durability - Use high density polyethylene to support weights up to 200 lbs. Ease of load - Reduce height of load to 17 inches. Easy Setup - Setup time within 10 minutes. Storage - Collapse unit to only 27 inches and allows stacking up to 9 feet reducing storage space and fits into compact cars such as a Toyota Corolla. Dispensing - Convenient beer/soda dispensing. How to get beer out? 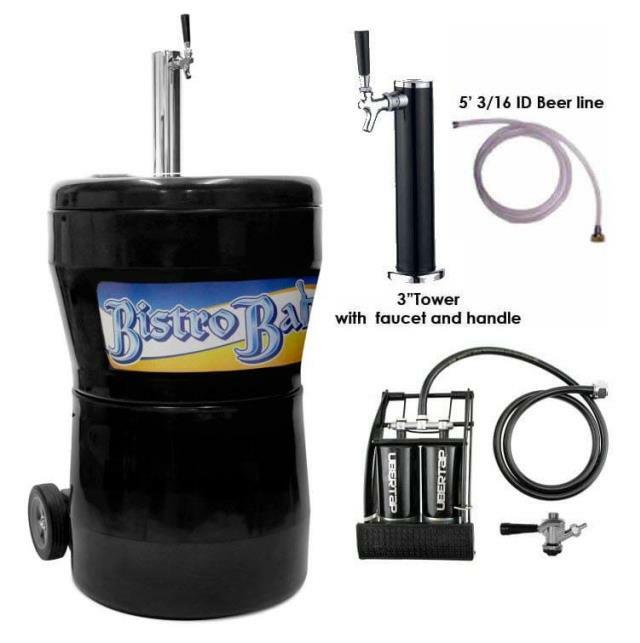 - Utilize our Ubertap foot pump to conveniently begin dispensing beer just like you would with the traditional hand pumps. Aesthetics - Good looks to display at graduations or corporate events. Click here for an overall explanation of the Bistro Bar. Click here for a how-to tutorial. * Please call us with any questions about our cooler beer keg w/foot pump rentals in Burnsville MN, Rosemount MN, Apple Valley, Minneapolis, St Paul, Twin Cities, South Metro,and Dakota County.